As the Catholic community of the 1920s grew, it elected to purchase an existing church structure on the corner of Weddington and Bakman and petitioned the Chancery for a resident pastor. In 921 Reverend Anselme Bois was appointed pastor and the parish was named Immaculate Conception. Following Father Bois was Father Leo Murphy as pastor. Four years later, during the pastorate of Father Emmet Panner the name was changed to what we know today as Saint Charles Borromeo, and the church was enlarged to accommodate 250 worshipers. In 1927 Father Edward Riordan came for two years followed by Father Michael Lalor. In 1936, Reverend Harry C. Meade was appointed pastor of Saint Charles Parish. Realizing immediately the property on Bakman and Weddington was not large enough to accommodate a full parish plant, he purchased seven 50 foot by 150 foot lots on Moorpark Street and accepted the donation of the site for the Church (now known as Monsignor Gallagher Hall) from the Goykes family, parishioners of Saint Charles. The new $50,000 church was designed by Lawrence Viole, a specialist in Spanish architecture. It had a seating capacity of 600 and was reminiscent of San Carlos Mission in Carmel, burial place of Padre Junipero Serra. The bell in the church tower, brought from the original church, was cast in Baltimore, Maryland in 1897, and is now permanently mounted in the courtyard of the present church. The first Mass was sung by Father Meade on July 17, 1938. The formal dedication of the church was held on Janurary 22, 1939 with archbishop John J Cantwell as celebrant. Assisting him on that occasion was his secretary, the Reverend Timothy Manning (who later became Cardinal Archbishop of Los Angeles). The rectory in matching Spanish style, was ready for occupancy on January 1, 1939. In September of 1947, classes were held for the first time in a new solid concrete school building which had 14 classrooms, a cafeteria, library, music room, and auditorium. The property across the street, to be used for additional parking and two classrooms, was purchased in 1948 for $50,000. The small building there is now used for group meetings and home to the Service Center which provides free food, clothing, toiletries, books, toys, furniture and household items to families in need. Hot showers, haircuts and a hot breakfast are also served once a week. 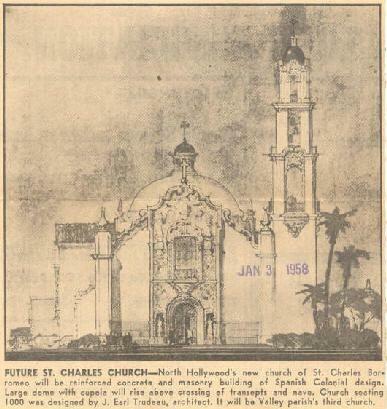 In 1952, the property on which the present church stands, was purchased for $110,000. Exemplifying the Spanish colonial style, the Church conveys a spirit of serenity and repose. Construction was completed in 1959, with seating for 1,000. The main altar was consecrated by Bishoop Aldon J. Bell. On Thanksgiving Day, parishioners, in solemn procession, moved into the new Saint Charles Borromeo Church. Msgr. Meade retired in 1973 and continued to live in the Parish as Pastor Emeritus until his death on April 11, 1978. Msgr. Kevin Keane was appointed as pastor after having served here previously as assistant for 12 years. During his administration the magnificent Von Zoeren organ was installed and dedicated in a three day celebration, culminating with a Mass of Thanksgiving and Inaugural Concert on Sunday, November 20, 1983. The instrument provides a fitting accompaniment to the internationally known Saint Charles Choir. For over 60 years, the parish was blessed with the musical artistry of Paul Salamunovich as Choir Director. His unique dedication to promoting the tradition of the finest of Sacred Music in Catholic Liturgy brought him innumerable honors. Upon Mr. Salamunovich's retirement in 2009, Mr. James Drollinger was appointed Music Director. Following Msgr. Keane's retirement in February 1984, he was replaced with Msgr. Thomas Kiefer. Msgr. Kiefer introduced many different parish activities and events. He started the annual Parish Festival in 1985, Pancake Breakfasts, the development of the Service Center as well as the weekly Friendship Sunday tradition of coffee and donuts. Msgr. Kiefer retired in 2000, and to take the torch from him was former associate pastor Msgr. Robert Gallagher. Msgr. Robert Gallagher was assigned here in January 2000. During his pastorate, Msgr. Gallagher oversaw the renovation and rebuilding of three parish buildings. Soon after his appointment, the Social Center, formerly Parish Hall, was renovated to more comfortably accommodate our many parish and school functions. Following this was the replacement of the Service Center building across the street from the church with our current Holy Family Service Center. His grandest achievement was the refurbishment of our church building itself, which was completed in 2014. Msgr. Gallagher retired on July 1, 2018 and continued to live in the Parish as Pastor Emeritus until his death on July 26, 2018. Father Jose Magana, former pastor of St. Anthony Parish in Long Beach, is now our 10th pastor of St. Charles Borromeo Parish.